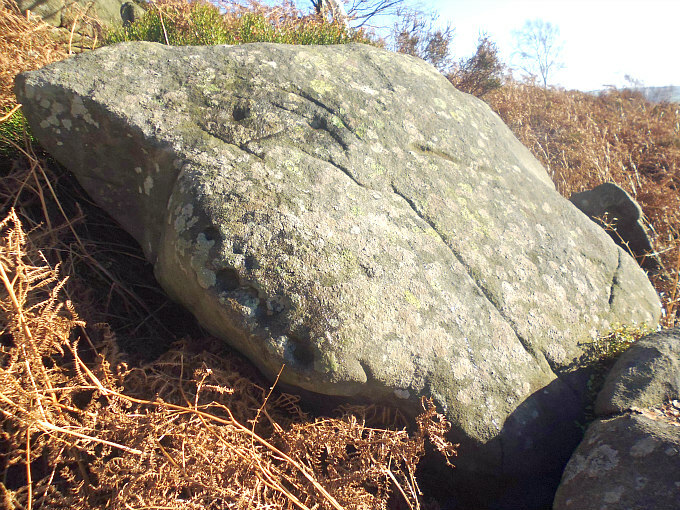 Cup-Marked Rock on Farnhill Moor with 40 cup-markings. OS Grid Reference: approx. SE 0064 4710. On Farnhill Moor above the north Yorkshire villages of Farnhill and Kildwick, 3 miles to the southeast of Skipton, there is a little cluster of ancient cup-marked carvings on some gritstone rocks. These carvings or petroglyphs are rather hidden away by the undergrowth at the south side of Jubilee Memorial, a white monument with a stone cross. One of these large rocks has four large cup-marks while the rock above it on the craggy ridge has forty or so quite distinct cup-marks. From Main Street in Farnhill take the narrow Crag Lane uphill for a little while, then when reaching the wooded area on the right take the path going east. After a short distance veer off to the north to meet up with a well-defined footpath heading towards the Jubilee Monument. Just downhill from the monument walk east into the often dense undergrowth towards the craggy ridge. Here amongst these gritstone rocks you will have to search around to find the carvings, but it will be well worth it in the end! 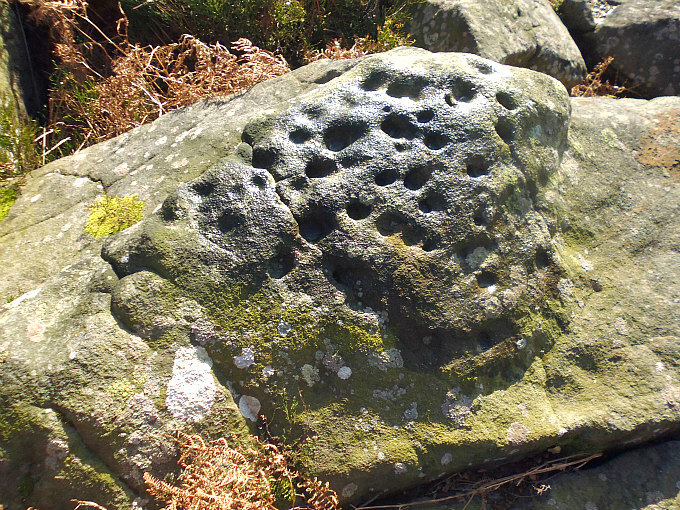 Cup-Marked rock on Farnhill Moor, near Skipton, North Yorks. 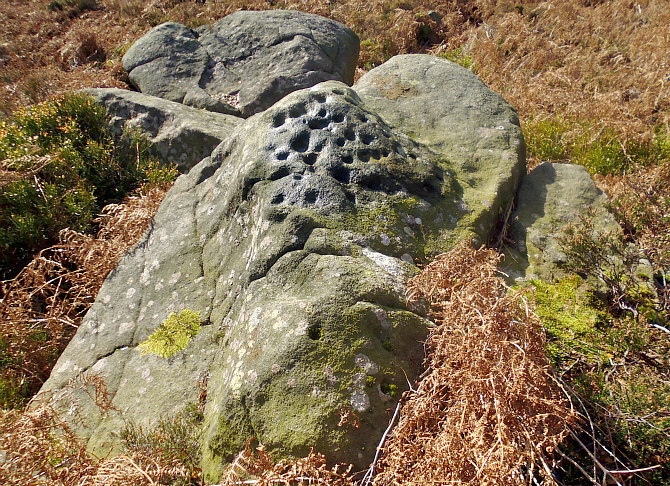 Farnhill Moor Cup-Marked Rock showing 4 cups on the side and 2 more cups above. 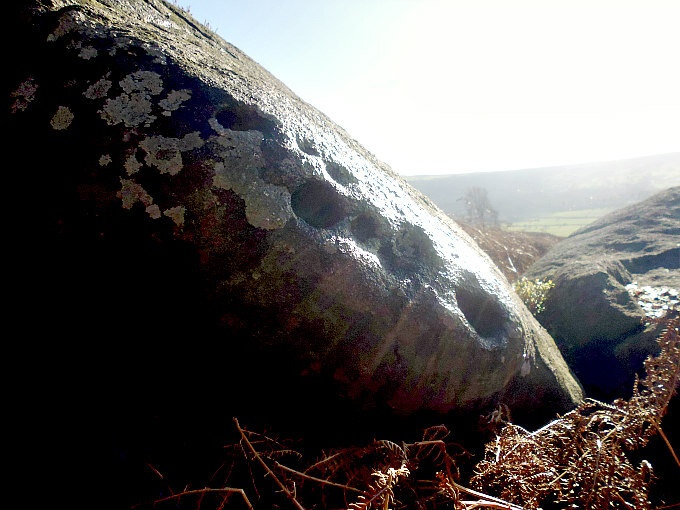 On the edge of a large gritstone rock, just below the craggy ridge, are four large distinct cup-marks (petroglyphs) and above those possibly a couple of tiny cups. These cup-marks are very easily missed and not that easy to photograph, unless the sunlight is just right and not shining right at you. You will notice the gritstone rock has turned almost white which is due to rain over thousands of years. On the ridge above, another large rock jutting out from the crag has on its face forty or more very well-defined cup-marks, some small cups and some larger ones, which have ‘become larger’ maybe due to erosion over 4,000 thousand of years or more. There are a few small cup-marks away from the main panel. We don’t really know what these cup-marks mean, or why they were carved, and so they must remain something of an enigma. It’s very likely, however, Bronze Age people had their settlements on these very moors at a time when the climate was much milder in winter than it is nowadays. To the northwest on Low Bradley Moor lie the stone-strewn remains of two cairns where the Bronze Age people buried their chieftains. The Jubilee Monument also called Jubilee Tower or Pinnacle was erected in 1887 to celebrate Queen Victoria’s Golden Jubilee. 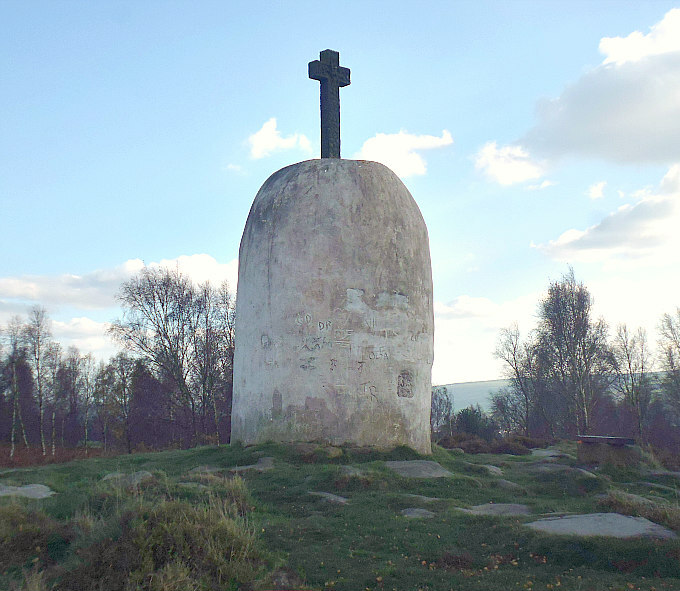 This white painted, bottle-shaped monument is 12 foot high and atop the edifice there is a carved stone cross. The monument is covered with Victorian inscriptions, but there is also more recent graffiti. It is thought to have replaced an earlier cairn indeed some think this was a burial cairn, similar perhaps to those that date from the Bronze Age which can still be seen over to the northeast on Low Bradley Moor, although there are now only large piles of stones strewn around in a sort of circular fashion. (See below for further details). Categories: Cup-Marked Rocks | Tags: Farnhill Moor Cup-Marked Rocks near Skipton in North Yorkshire | Permalink.